Psychiatric Symptoms, Mold and Environmental Toxicity | Judy Tsafrir, M.D. Environmentally acquired illnesses (EAI) are often not recognized by conventional medicine. Patients run from one doctor to another and no one can help them. The usual lab studies often reveal nothing treatable because their health care providers are not testing for the right things. When all the studies come back normal, a patient may be told that her somatic concerns are an expression of her anxiety or depression, and that she should see a psychiatrist. If the underlying cause of these symptoms is an environmentally acquired illness, diagnosis is critical to healing. Chronic exposure to harmful environmental toxins and other triggers interferes with the normal functions of the body. They can affect the mind. It is not uncommon for children or adults with recurring exposures to moldy indoor environments at home, work, or school to develop multiple symptoms. Treatment of EAIs may lead to substantial improvement of health. It is hard to imagine that so many diverse conditions and symptoms could result from exposure to environmental toxins, “but it is a fact that people suffering from environmental exposure suffer an astonishingly wide range of severe symptoms. In fact, though the list is long, it understates the devastating consequences of environmentally acquired illness,” according to the ISEAI website. I now routinely test most patients in my psychiatry practice for mold toxicity. I believe that it should be ruled out in cases of depression and anxiety accompanied by other medical and neurological symptoms—whether or not the patient is aware of water damage in the home. As mold toxins are so damaging to the immune system, once a patient is treated for mold toxicity and the immune system is strengthened, addressing other issues that may be present, like cChronic Lyme and co-infections, is better tolerated. Laboratory testing for mold toxins has become less expensive and is done via urinalysis. 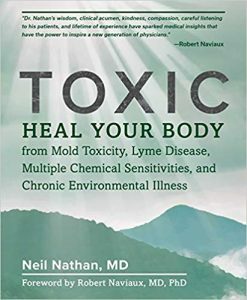 Persons looking for more information might benefit from reading “Toxic: Heal Your Body from Mold Toxicity, Lyme Disease, Multiple Chemical Sensitivities and Chronic Environmental Illness,” by Neil Nathan, MD, a family practice doctor in California with a longstanding interest in treating chronic acquired environmental illness. At the end of January, an online Toxic Mold Summit will be hosted by Margaret Christenen, MD. It will be streamed for free between Jan. 28-Feb. 3, 2019, after which the recordings can be purchased. This event features leading integrative practitioners in this field and promise to be outstanding. Treating environmentally acquired illness is a very new field, and there is so much to be learned. There is much pioneering work to be done. I believe it is the future of psychiatry.